Vegan pumpkin soup makes for the best creamy, velvety and rich fall meal. Served sprinkled with toasted almonds and fresh rosemary. 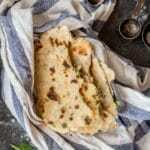 Ready in under 30 mins and made with only 7 ingredients. Gluten free & Paleo too! 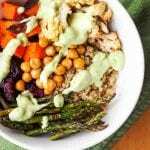 ……….Click HERE to Pin this Recipe For Later………. Vegan pumpkin soup is my latest obsession. My overall pumpkin obsession started in March of 2013 when D and I were renting an apartment in Penang, Malaysia for over a month, and it’s pretty much lasted ever since. You see, growing up pumpkin was never one of the vegetables I really liked so I never once indulged in a creamy vegan pumpkin soup recipe. All that had to change. What even opened my eyes to cooking with pumpkins was how ridiculously cheap they were Malaysia – I’m talking $1 for an entire enormously large pumpkin. I don’t remember the pumpkin prices here in the states but I know I just spent $6 on a butternut squash at Wegman’s so $1 for a huge pumpkin seemed like a steal to me. And so it was the perfect opportunity to give this veggie another chance. And so I stocked up on lots of pumpkins at the grocery store. It was all I needed to finally change my mind about pumpkin. Is it the best veggie ever or what?! And yes I know it’s only the first half of September, but if you ask me Pumpkin season starts September (or better yet never ends). I mean I can even eat pumpkin in the summer time! Who else is with me?! 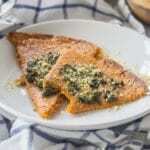 Pumpkin is so so soooo delicious and even more so when pureed and served in a large soup bowl (or when made into curried quinoa pumpkin vegan collard wraps, Peruvian vegan fava bean vegetable pumpkin stew, vegan pumpkin dip, or vegan ricotta stuffed zucchini ravioli over pumpkin puree). Basically I’m trying to tell you that you need pumpkin in your life in all ways and recipes, not just with this one vegan pumpkin soup. I never knew how versatile pumpkin was. Now that I’ve been cooking with it I really see how it can be used to so so many different recipes. I mean it literally is great in salads, soups, desserts, smoothie, stews, wraps, dips, pasta, you name it, pumpkin can do it. But let’s get back on the topic of this super creamy and dreamy vegan pumpkin soup. A pureed soup just is the definition of comfort food for me. I could have bowl after bowl, easily. 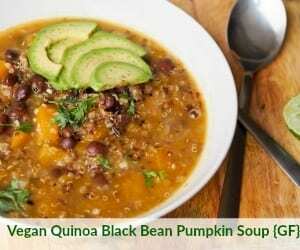 And when I wasn’t slurping away on this creamy pumpkin soup – I was feasting on this un-pureed vegan quinoa black bean pumpkin soup (another favorite of mine). And, as long as you dice the pumpkin into small cubes it cooks fairly fast. 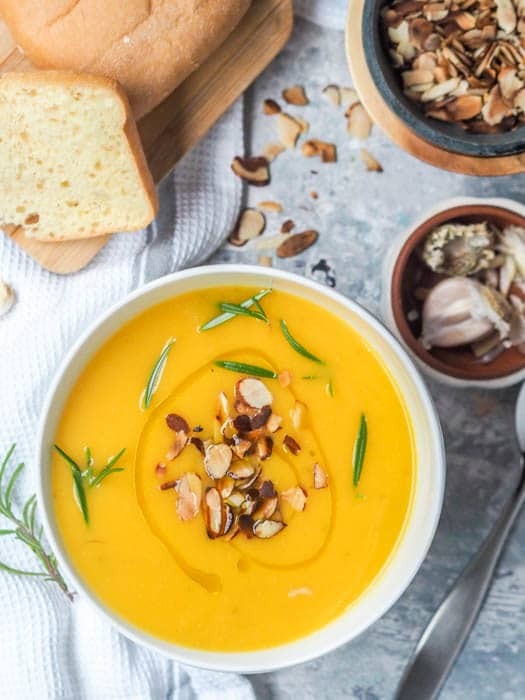 Just a few other few ingredients and you’ll be slurping up this vegan pumpkin soup recipe in 30 minutes. Rosemary and pumpkin are made to be together so don’t leave that out. And coconut milk gives the soup an even creamier richer texture while still keeping it vegan. Another key to this recipe is to use home made stock/broth. If you only have store bought it will still work, but if you have some home made from scratch broth around be sure to use that. The proper broth truly elevates the flavor. For the non-vegan readers feel free to use home made chicken broth instead of veggie broth. For a bit of added crunch I like to sprinkle toasted sliced almonds on this vegan pumpkin soup when serving. 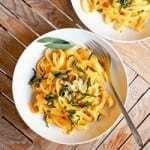 The nutty flavor blends perfectly with the rosemary and ever so slightly sweet pumpkin. You could use croutons instead or just leave the pureed soup as is. If you ask me personally croutons are a bit too crunchy and dense for my taste and they take away from the delicate nature of this soup, but that’s a matter of preference. I know my mom loves the soup with croutons so you might too, but I do encourage you to go the toasted sliced almond route first! This is yet another winning soup recipe to add to my collection. I love how quickly this soup cooks and for those days when you simply do not have the time to stand over the stove for hours, a 30 minute recipe is exactly what you need. 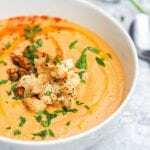 If you love a creamy soup but pumpkin isn’t your thang, check out my roasted cauliflower soup instead! and vegan butternut squash gratin with rosemary cashew cream. 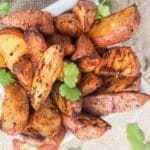 PS – for more 30 minute recipes be sure to check out my 30 minute recipe collection, with tons of quick yet delicious cooking ideas. 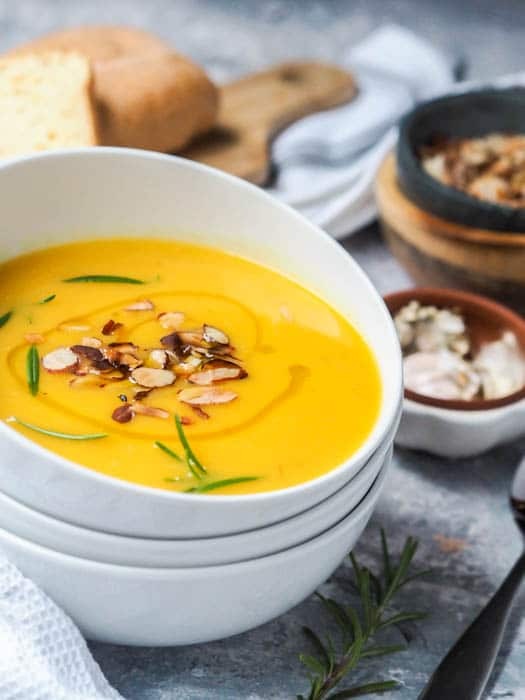 Leave a comment to let me know what you think of my vegan pumpkin soup if you end up making it (or if you have your own spin on a pumpkin soup vegan recipe please share below as well)! Vegan pumpkin soup makes for the best fall meal. Served sprinkled with toasted almonds and fresh rosemary. 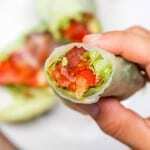 Ready in under 30 mins and made with only 7 ingredients. Gluten free too! Heat oil in pot over medium heat. Add onion and cook for a few minutes until translucent. Add pumpkin and garlic and continue to cook for a few more minutes. Add rosemary and vegetable broth. Bring to a boil, reduce heat to low and simmer until pumpkin is soft and cooked through. Add salt to taste. Puree soup in a blender (in batches) and return to the pot. Add coconut milk and simmer for another minute or two. Serve garnished with toasted sliced almonds, a drizzle of olive oil and fresh rosemary. Love that the recipe calls for coconut milk, look forward to making this! This looks great. I make a similar soup with squash and carrots, but now I’m thinking I will have to give this one a try. Yummy!! Your Creamy Pumpkin Soup looks delicious. Your place at our table is very special and thanks so much for sharing your wonderful food with all of us at Full Plate Thursday. Hope you have a fantastic week and come back real soon! 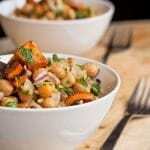 I love this soup recipe and that it is vegan, which I am! I love how simple it is as well. I have never had pumpkin soup before, but am intrigued. It looks so easy and delish! 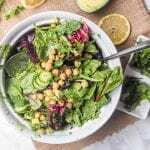 So glad you have found a new vegan recipe to test out from my site! Hope you enjoy it : ) I never used to love pumpkin but now that it has grown on me I really love this soup. I love creamy pumpkin soup. 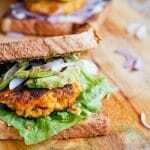 Thank you for sharing such a simple recipe! I will have to try it. Hello! I was wondering if substituting the pumpkin with canned pumpkin would work? If so, how much should I add? I think using canned pumpkin would work and I think 2 cans should work! Just make sure to add the broth slowly so that if it’s not enough canned pumpkin just add less broth. What size pumpkin do you use? A small-medium sized pumpkin. Next time I make the soup I will make sure to measure in cups. I apologize for the confusion! 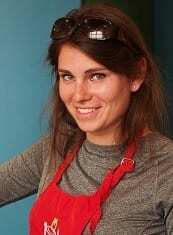 Is vegetable broth the same as vegetable stock? Thanks. How many cups of pumpkin equals a 1/2 pumpkin? I think my pumpkin is much bigger than usual. Thanks. Looks like there are many different gluten free ones: https://www.google.com/webhp?sourceid=chrome-instant&ion=1&espv=2&ie=UTF-8#q=gluten+free+vegetable+broth&tbm=shop Just check on the label to be sure when buying in stores! Late to the game, but we just hit a pumpkin patch and thought we’d crown off the day with pumpkin soup dinner. I’m looking for inspiration for a vegan pairing with this? Just a small regular pumpkin for cooking. I was curious if you are suppose to take off the skin and only use the inside or if the pumpkin chopped includes the skin? Yes you need to remove the skin and the seeds to make this soup. The photos have been edited in Lightroom. This recipe is incredible! thank you so much for sharing it. 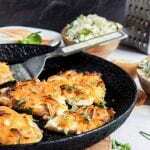 Thank you for sharing your great recipes. I like the pumpkin soup to be really thick. Is the coconut milk thick enough for that purpose or is there another form of coconut to be used to make it thicker. Is there such a thing as condensed coconut milk like condensed milk? Coconut cream is an even better thickener for soups – or just buy coconut milk, and skim the coconut cream from the top of the can (leaving the coconut water at the bottom). Have never seen condensed coconut milk before. So glad you liked this! 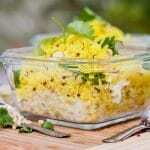 Great idea to add extra quinoa! 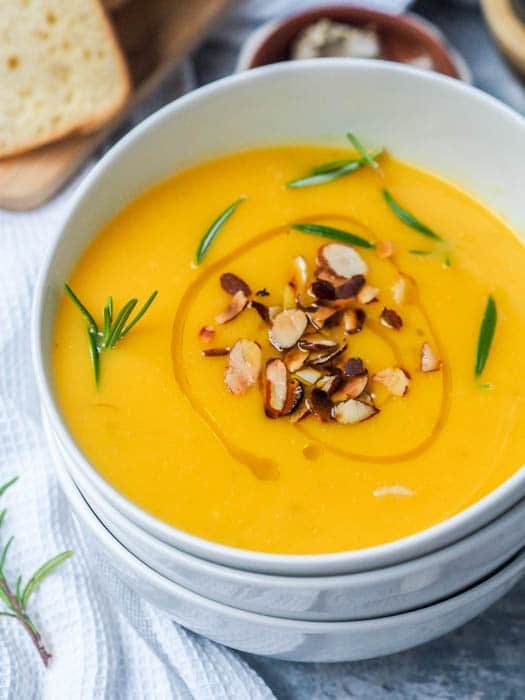 Have been hunting online for a vegan pumpkin soup and this one looks super easy! Just wondering if you can taste the coconut milk at all? My husband isn’t a big fan of coconut…. 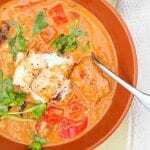 I personally do not notice the taste of coconut milk in this soup – I know some people are super sensitive to the coconut flavor and in that case you might want to use an almond milk or other non dairy milk instead. I like to use coconut milk because I find it richer and creamier than other nut milks, but if you’re husband isn’t a big fan I would mix in a bit of coconut milk into one bowl of the soup for him to try and see if it works for him? That way you can test it first! I love pumpkin soup, and love the fact that this is vegan. 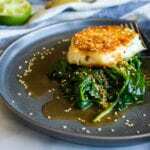 I will have to try making this with coconut milk, sounds very delicious! Pumpkin soup is the best! Your pictures are so gorgeous! I can ‘see’ how creamy the soup is!!!! Must try this pumpkin season! Thanks so much! You must try this! Pumpkin soup is so delicious and I just love when fall comes around so recipes like this start showing up. Looks delicious especially with the coconut milk. Yes the coconut milk makes it perfectly creamy while still being vegan! I’ve only recently become a pumpkin soup convert myself! There is something about using fresh pumpkin that makes recipes so much better. Your pictures are lovely and using coconut milk is a great idea to give the soup that creamy texture without using cream. Yes I always opt to use fresh pumpkin! The canned puree is never quite the same! What a total treat to enjoy after a cool day outside! This looks delicious! Thanks! Perfect after a cold day indeed! I always add some ginger to MySpace that gives it some extra spice and is so delicious! Love the addition of ginger! Hi! I have 2 questions…under one of your responses you said you used 4 c. Pumpkin and under ingredients you listed 8c. And I have no veg broth can I use water instead? 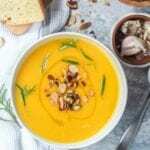 I updated the recipe recently to make a larger batch of soup so if you are following the recipe as written you will want to add 8 cups of diced pumpkin. Yes you can use water instead though it will not be as flavorful of a soup without the broth but it will still work! this recipe is so easy and the soup is delicious!! after i added the coconut milk at end, it still didn’t taste quite right though. so i added some sugar AND lemon juice. so goooood!! Love the addition of lemon juice! Lemons make everything better!